Located near Niagara Falls in Lewiston, New York, the Robert Moses Niagara Hydroelectric Power Station is an important structure. The plant gets its name from the New York city planner Robert Moses and is owned and operated by the New York Power Authority (NYPA). Construction on this power station began in 1957 to replace the Schoellkopf Power Station. The plant opened in 1961 and at that time it was the largest hydropower facility in the western world. It uses 13 generators at a capacity of 2,525 megawatts to produce electricity. The Robert Moses Niagara Power Plant and the Lewiston Pump Generating Plant together produce a total of 2.4 million kilowatts of electricity. 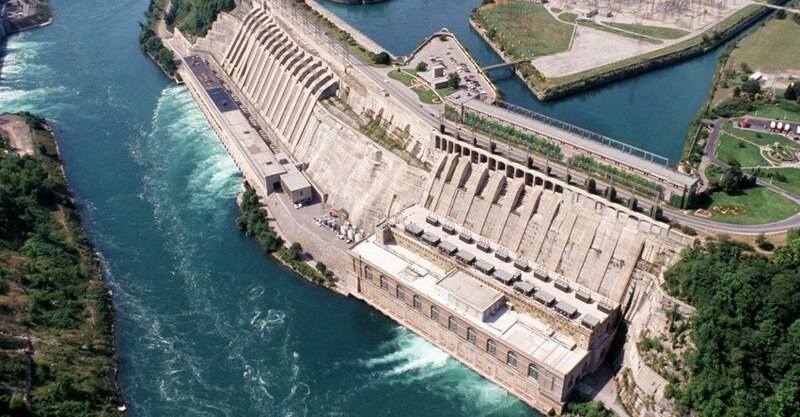 On the opposite side of the Niagara River you can see the Sir Adam Beck Hydroelectric Power Stations in Ontario, Canada. If you want to visit the plant and see and understand the way things work there, you can do so. Due to security reasons, tours of the inside operations of the power plant are not conducted. You can head to the Niagara Power Project Visitors Center – Power Vista that is located above the power plant. While people of any age can enjoy this tour, it’s a great learning experience especially for children. During their visit, they can understand all about hydroelectricity and the important role the plant played in the expansion of Niagara. You can visit and go around on your own or try a customised guided tour tailored according to age groups. An interactive kiosk in the exhibit area provides information to the visitors. You can take in the views at 350 feet above the Niagara River from the glass enclosed walkway or go to the outdoor observation deck to enjoy the sights. The Basics of Electricity Show is tailored to educate children according to different age groups and is a great experience. These are hands on fun as well at the Electric Lab with 50 interactive exhibits that children would love to press, push, pull along with several practical activities. The Terrain Map which is an original scale model exhibit uses an audio presentation to show how the Niagara River is used to produce electricity. There are several video presentations on different topics that are interesting as well as educative. Visiting hours are between 9 and 5 all days a week. Admission is free. There might be slight changes in the timings due to renovations or other such factors.